If you played a word association game and the term “bran” was thrown at you, chances are you’d blurt out responses like, “constipation!” “old people!” “laxatives!” Whenever I’m in the cereal aisle and I see that box with the big, bold All-Bran logo, cheap and very literal toilet humor comes to mind. Note to Kellogg’s: making John McEnroe the star of your 10-Day Challenge commercials isn’t going to increase cereal sales. If you were to wake up to find John McEnroe perched at your bedside, wouldn’t you just go right then and there, thereby negating the need to have a bowl of Kellogg’s All-Bran? Let’s turn our attention now to bran in its baked incarnation: the bran muffin. It’s the ugly duckling of the breakfast breads with its dung brown color and lack of accessories in the form of streusel topping and/or chocolate chips. If you’re a late morning arrival at the office cafeteria, it’s usually only crumbs and bran muffins that remain. But despite the fault-finding I’ve been doing, I do like bran cereal and muffins. I do! 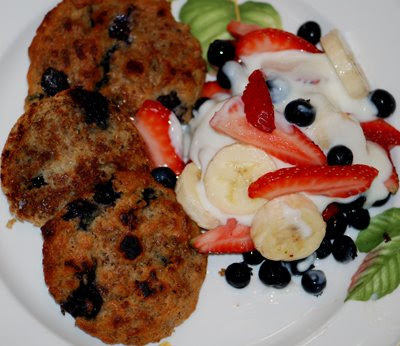 Sliced bananas and a handful of blueberries make those dry doodles agreeable, and a great bran muffin is nutty, tasty, and won’t sit like an undigested rock in your stomach. I hadn’t baked any in years, and was happily surprised with the results I got from this recipe. 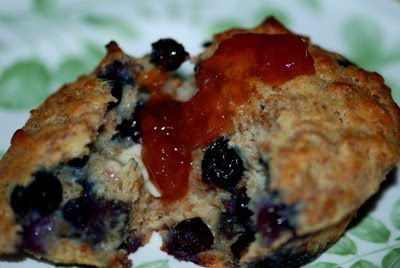 These muffins are moist and light and can be eaten plain, spread with butter and good preserves, or my favorite, split in half and grilled a day later. P.S. to Kellogg’s: These are a far better advertisement than Mr. McEnroe. Yields about 1 dozen standard muffins. -Preheat the oven to 400˚F with rack in the center. 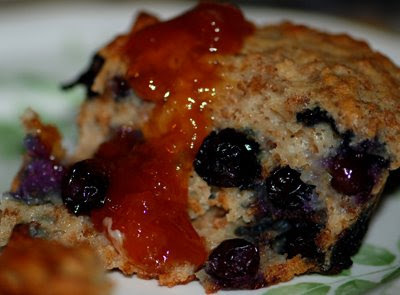 -Grease a standard 12-cup muffin tin. -In a large bowl, whisk together: yogurt or buttermilk + eggs + melted butter + oil + maple syrup + All Bran. Stir in the blueberries and allow to stand at room temperature 5 – 10 minutes. -In a different bowl, combine the remaining (dry) ingredients. -Once the All Bran mix has rested, add the dry ingredients mix and stir briskly with a large spatula or spoon till evenly moistened, using no more than 15 strokes. -Spoon the batter into each muffin cup, filling till nearly level with the top of the pan. -Bake 20 – 25 minutes until browned and a cake tester comes out clean. -Allow muffins to rest in tin about 5 minutes before turning out on rack to cool. Serve warm. -To freeze leftovers: Cool completely and wrap muffins individually in wax paper and store in plastic baggies. -To serve frozen muffins: Warm in a 350˚F oven, microwave 20 – 30 seconds, or split in half horizontally, butter both sides of each half and grill over medium heat till golden and hot. Grilled muffins served with fruit salad and honey-laced yogurt. mean BRAN-Y AND BEAUTIFUL | High Heels & FRIJOLES is kinda boring. or a pic or two to grab readers excited about everything’ve written. Useful info. Fortunate me I found your site by chance, and I’m shocked why this twist of fate didn’t happened in advance!